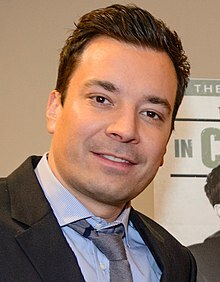 Thomas James "Jimmy" Fallon (born September 19, 1974) is an American actor, comedian, singer, musician and television host. He was the host of Late Night with Jimmy Fallon. He was a cast member of Saturday Night Live and has also hosted that show. On April 3, 2013, NBC announced that Fallon would be the new host of The Tonight Show, beginning at the end of the 2014 Winter Olympics. Fallon was born on September 19, 1974 in the Bay Ridge neighbourhood of Brooklyn, New York. He was raised in Saugerties, New York. He studied at The College of Saint Rose. Fallon married Nancy Juvonen in 2007. ↑ Carter, Bill (4 April 2013). "Leno Blesses 'Tonight Show' Succession Plan". The New York Times. Retrieved 4 May 2015. ↑ "Jimmy Fallon Biography (1974-)". filmreference.com. ↑ "Jimmy Fallon Marries Producer Girlfriend". PEOPLE.com. This page was last changed on 23 April 2019, at 08:27.